DM molecular art creates images showcasing the beauty of what builds every living organism on the planet, DNA. These DNA images highlight the interconnectedness of all biological creatures, everything from humans to plants, animals, and even single-celled organisms such as yeast. This art is inspired by the beauty of genetic biodiversity and the desire to showcase this unique view of organisms as a tool for teaching and inspiring conservation. The DNA portraits are made in a scientific laboratory using a sample of a biological organism, such as brewer's yeast or plant tissue. The DNA is extracted from the sample, amplified using PCR and then run on an agarose gel and a high resolution picture is captured. The photos then go to post-production for color and stylistic manipulation creating the images you see. The images you see are all processed and photographed by Dash Masland. Dash has worn many hats as a National Geographic Young Explorer, M.S. Marine Scientist, and Director of Finance for a small brewery. Her mind always wanders back to creative outlets and thus inspired her first molecular art series, beerDNA, which merged her two worlds of science and beer. 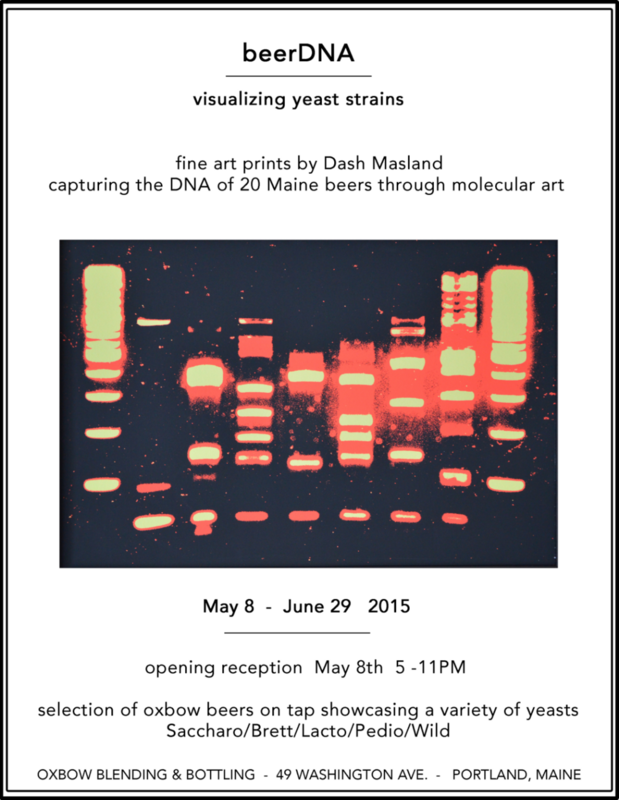 She is no longer actively working in the sciences or at the brewery, but her molecular art interests continue on. She is currently working with foodDNA and maineDNA, inspired by her home town right outside of Portland, Maine. Dash has also worked with both Eric Laurits (check out his work at www.ericlaurits.com) and Geoff Masland on post-production. When she needed a professional photographer to help her capture hi-res DNA photographs, she turned to Eric for help. Eric was intrigued by using DNA to showcase subtle expressions and thus joined the team leading the post-production for beerDNA. Geoff has an eye for composition and color which helped turn the vision of molecular art into a reality, as he has been instrumental in the post-production process. Having worked in a molecular lab for many years, I see such beauty in the lines DNA creates when run on agarose gels. I captured and manipulated this photograph, It's a Microbial Matter (beerDNA series, 2015), in a small homegrown lab created exclusively for visually exploring DNA. The intent of this image is to showcase the splendor of DNA and challenge both scientists and non-scientists alike to look at this building block of life as a true work of fine art and to highlight the wonder of genetic biodiversity. The study subject is the single-celled organism, yeast. Yeast plays critical roles in ecosystems such as decomposing biological material and degrading environmental pollutants. As we strive to preserve and protect biodiversity on our planet, it is crucial that we do not overlook the importance of microbes and the role they play in conservation. beerDNA: a collaboration with Maine craft breweries to showcase the beauty of an integral part of what makes each brewery so unique, their yeast. Yeast is a critical part of the brewing process in that it ferments the sugars released from grains and converts them to alcohol. While there are a few species of yeast that are used in the brewing industry, the most common is Saccharomyces cerevisiae, also known as ale yeast. Other yeasts are used to produce different styles of beer such as Saccharomyces pastorianus for lagers and Brettanomyces sp. for sour beers. The scientific methodology we use in creating our art is designed to determine the species of a biological sample, and we have treated each yeast sample identically in the lab. Thus, you will see that the patterns in the yeast DNA tend to be quite similar. They will show differences if the yeast is of a different species, due to the variation in DNA, but also will show slight differences if the yeasts are highly mutated strains of the same species. For instance, there are over 30 different strains of Saccharomyces cerevisiae available at a commercial yeast house, all utilized for different beer styles. In addition, as breweries continue to propagate their yeast throughout the years, their house yeast will likely develop DNA mutations that create the many unique flavors that we experience. So, if you look closely, you may just spot a few of these genetic differences between each brewery's yeast in our art. Bangor Daily News. Your Ultimate Maine Holiday Gift Guide. 2015. Alex Steed. Science Inspires Art: Biodiversity/Extinction. 2015. New York Hall of Science. PBS Newshour. July 2015. There's a story living in your beer's DNA. Downeast Magazine. June 2015. DNAle Fingerprinting.